While city officials remain silent about when, or if, a likely five-year contract extension will be signed, all indications point to it being a matter of time before a deal is struck, despite the lateness in comparison to the completion of past Florida-Georgia contracts. There’s been a little more concern than usual about the extension of this contract, which expires after the game on Oct. 29, 2016, because the parties typically finish a deal at least a year in advance. The last two extensions were signed on Sept. 1, 2010, and Oct. 25, 2005, more than a year before the contract’s expiration. One of the big reasons the negotiations took longer this time is the schools wanted to see how the Jaguars’ planned renovations to EverBank Field club seat areas in the east and west stands might impact stadium capacity. The Jaguars are reducing club seats from 11,000 to about 8,000 for NFL games, but the schools are adamant about capacity remaining at 82,917 for Florida-Georgia. When Foley and McGarity were shown the plans in late October and given options for how the Jaguars intended to replace those club seats, the wheels were set in motion to proceed on contract talks. 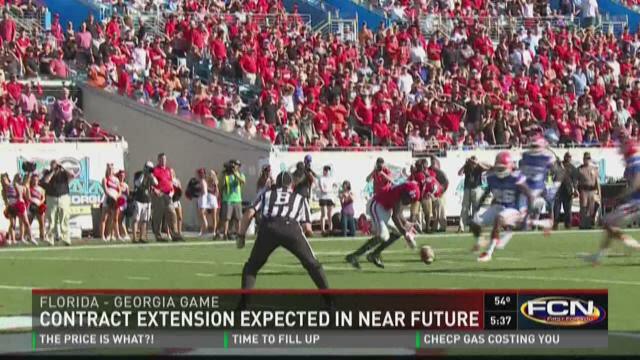 The concern for the schools about temporary seats in the east and west stands is because it’s where many of the wealthiest boosters sit for the Florida-Georgia game. Among the details that might have to be worked out is whether the city will continue to run the game-day operations or turn that over to the Jacksonville Sports Council, a move that was advocated by JSC president Rick Catlett. Another potential issue is whether the Jaguars or the city will pay the $1 million to $2 million fee to replace the seats for the Florida-Georgia game and then make the stadium NFL-ready for the next Jaguars home game.